Rich with history, culture, and natural beauty, there’s a lot to do and see in Las Cruces. You will take pride living and working in this remarkable community, which has all the perks of both small town and big city living. No matter if you are young or old, single or part of a family, artsy or outdoorsy, you will discover a fulfilling life in Las Cruces. You won't find harsh weather here. Enjoy our mild winters and sunny summers. Buy great local goods from our wonderful farmers, artisans, and crafters. While we feel like a close-knit community, we certainly are not little. We are proud to be the second largest city in New Mexico. There’s nothing like the spirited environment of a college town. Nearly 20,000 students attend Las Cruces’ New Mexico State University. Living in Las Cruces, you’re never too far away from adventure. 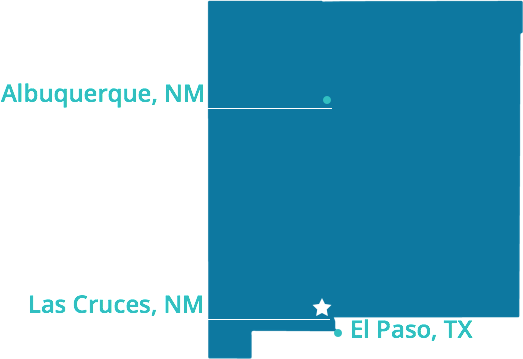 Las Cruces is conveniently located in southern New Mexico, less than an hour away from El Paso, Texas and approximately 3 hours from Albuquerque.